A highly resilient data and communications network that supports easy accessibility and cost efficiency is a requirement for hospitals and medical facilities that seek to leverage technology to digitally transform their processes. 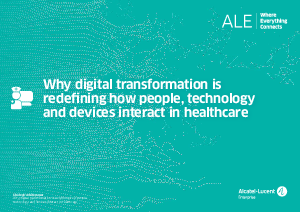 Alcatel-Lucent Enterprise (ALE) provides a broad range of robust and secure networking, infrastructure and communication products and services to connect patients, caregivers, staff and the entire healthcare ecosystem. ALE specialized data and communications networks for healthcare providers optimize the care pathway through improved communications and more efficient processes to provide more timely, safe and effective care.